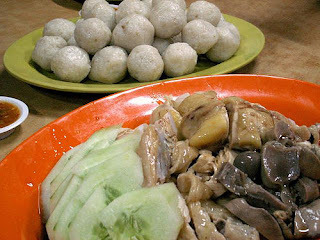 Chicken rice ball is what Melaka is famous for. Rice is boiled in chicken stock and some chicken oil and salt, flavoured with ginger, garlic and shallot and make into rice balls then served with boiled chicken pieces and garnished with cucumber, and garlic chilli sauce. MENTION chicken rice balls and the first place that comes to this writer's mind is Malacca, because it was at an outlet inJalan Jonker in the old part of Malacca town that I had my first taste of that dish one Christmas holiday years ago. And, over the years, the Nam Wah Chicken Rice gall restaurant and Famosa Chicken Rice Ball outlets that chum out rice balls with specially designed machines were added to the list. Those who cannot forget the taste of the food at Nam Wah famous for its chicken rice balls made with a difference – and crave for it, can now head to an offshoot of the restaurant that has opened in Taman Prima 5aujana in Kajang. It has been operating for more than a year and the JR Rice Bowl halal restaurant, as the outlet is known, has been faithfully serving a circle of loyal customers. rice," said Danny Chew, who coowns the restaurant with a Malay partner. Chew added that most of his customers were Malays and the dishes were prepared by Malay cooks, but his Chinese customers could not tell the difference. That is another difference. The rice balls are steamed with ginger and garlic and served with chick en prepared according to 'homemade' redpes. TOe chicken serwings come deep-fried, roasted or steamed." he added. He added that the soup served with the chicken rice was not the type in which monosodium glutamate (MSG) was added to enhance the taste. "Here, the chicken soup is made with groundnuts and cabbage which complement the garlic and ginger in the rice balls" Chew said adding that his customers lowd its umque taste and many had comple mented him on the recioe. The rice balls which are slightly bigger than ping-pong balls, are sold at 5O sen each. Besides selling the chicken rice balls JR Rice Bowl also nas wanton gnreng which IS served with home made mayonnaise sauce that is yellow in colour - an innovation of the restaurant. The outlet also offers a variety of dishes that go well with the rice balls. There are vegetable dishes like Sayur Taugeh, Sayur Cendawan Oyster Sauce and Sayur Pakchoy with oyster sauce, as well as Udang Wanton Goreng. And, of course, there is also the usual variety of noodles gantonis Kuey Teow, Char Kuey Teow, Nasi Goreng Yong Cheow and Ying Yong Kong Fu. For dessert, diners can try the fruit jelly custard, Scottish fudge cake or the American fruit cake. all in house specialties. The restaurant is usually packed at lunchtime on weekdays and those who cannot find seats are usually happy to tapau their favourlte dish. "I have regular customers who sometimes call me on my hand phone to tell me that they are coming for lunch or want melr )rder packed." satd Chew who added that most of his regular customers had his band phone number and he liked the arrangement as it made things easier.